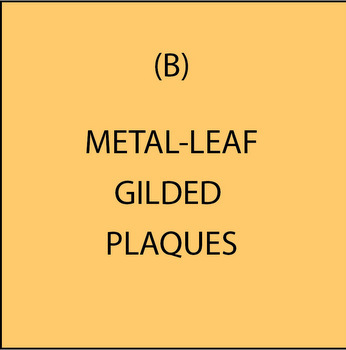 This section (B) shows provides information and shows photos of signs and plaques made with our gold- and silver-leafed gilding process . This is a more expensive alternate to the liquid metal coating process described in Section (A), above described in M7000.. We use gold- and silver-leaf gilding for text, borders and sometimes art for a wide variety of plaques and signs. This is the traditional way of putting a thin metal veneer on a 3D plaque or sculpture, using techniques first developed by the ancient Egyptians. (Many of King Tut's artifacts were gold-leaf gilded). Gold and silver-leaf gilding was refined and used extensively in palaces and cathedral in Europe in the 1100s to 1800s . As you would expect, the materials are expensive (24K gold-leaf is $2000/ounce) and the process of gilding is exacting and very labor-intensive. We have two craftsmen qualified to do gold-or silver leaf gilding, and they do a beautiful job. We often gild V-cut engraved letters and 3D carved art appliques, but only occasionally do we gild an entire plaque because of the expense. It substantially increases the price of a wall plaque if the entire plaque is gilded, compared to being metal coated (above) or painted with metallic paint (see (C) below). We typically use 1-Shot gold, silver and copper metallic paint for large background areas, and inly gild text, birders, and artwork. However, metallic paint is not as luminous as the metal leaf, and may eventually lose its luster over decades due to UV radiation and oxidation (especially if it is outside) whereas 24K gold leaf will keep its shine forever. We can also copper-leaf gild a plaque, but the copper metal coating process described in (A ) above is less expensive and looks better, so we recommend that instead, unless only a small applique on a larger sign or plaque is required to have a copper veneer..
To get prices for the above or similar plaques at any size please call 951-698-8484 or email us at info@artsignworks.com. Please click on "Return to List" below eight to see our photos of our bronze, brass, copper, gold, silver, stainless steel and aluminum plaques and signs.